We continue to believe that a surface rail (SR) extension (like Bombardier’s Olympic Line of 2010, not Skytrain) to the existing system along Broadway, as part of a multi-modal network (MMN) across the City (which would include a combination of higher-capacity, zero-emission electric streetcars, articulated trolleybuses and surface rail, as capacities require), provides the best options for answering the above questions. If you provide a good, efficient transit network covering a much wider area of the city than only one corridor, you are increasing the accessibility of transit to a much larger and broader segment of residents. At-grade modes of transit give you a visual connection to what you are travelling through, and an on-off option to take part in the life of that community, including shopping. A tunneled train would not. 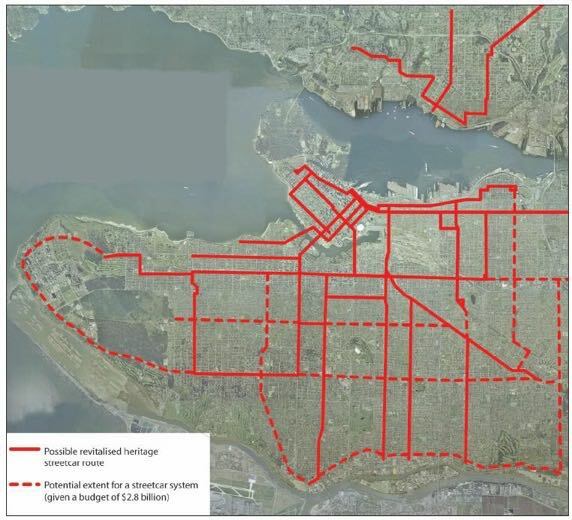 Also, the most likely to be used construction method for Skytrain of cut and cover will be a huge cost to local businesses in lost revenues or loss of their businesses (see Cambie Corridor). 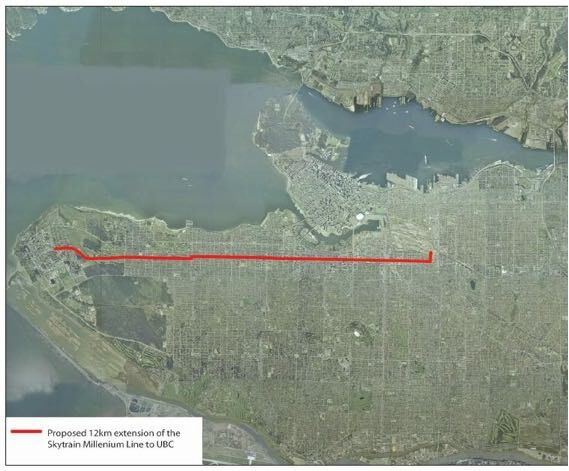 Recent estimates show that a SR/MMN system could be built out in approximately 2-3 years versus a Skytrain system taking 15-20 years, if completed as proposed to UBC. A multi-modal network alone would require even less time. If we are at all concerned about climate change, we need to act more quickly than 15-20 years in getting people to transition out of their cars. Various studies, including Translink’s own (Phase 2 Evaluation Report, UBC Line Rapid Transit Study, Aug. 2012), show that a surface rail extension can provide the needed capacity for the next 30 years at a cost estimated to be 1/3 to 1/6th the cost of a Skytrain system. For comparison: on left, Skytrain, on right for same cost, SR/MMN network. Most of the new systems around the world are surface rail: a clue? We are not asking for a start-over. We are requesting that you consider this transit solution holistically: look at Vancouver Metro’s needs, not just each individual city. If an SR and/or MMN mode is selected, then it becomes possible to share purchase power with Surrey, perhaps others, to use economies of scale to purchase together. We believe it’s more productive to look at long term needs to provide a network for all municipalities within Metro, not just Surrey or Vancouver, to link systems together to really provide access to all, and to best transition people away from car usage. Be truly Green. Additionally, we are requesting that the options be revisited with meaningful consultation, full transparency and clear and available data. We are aware that the subway was promoted through the Mayors’ Council by the current Vancouver mayor without full disclosure of the different options. Vancouver did not support the subway in the plebiscite. The decision on mode should be made by the next Mayors’ Council given that significant change will result from the fall election. Consideration should be given to a slightly different option from those articulated in the 2012 Steer Davies Gleave report: Skytrain link from VCC to Cambie and Broadway, with surface rail from Commercial to UBC, as part of a multi-modal network providing access to good transit for all of Vancouver. We want to do this right; we need to do this right.